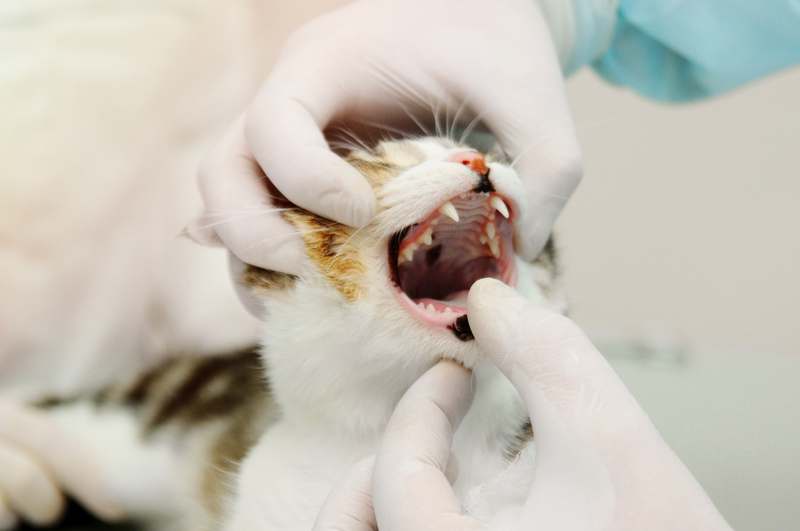 A very important part of your feline friend’s annual examination is your cat’s dental exam. Your veterinarian will carefully examine your pet’s mouth for any signs of dental disease. These signs may include bad breath, tartar, gingivitis and loose or missing teeth. If you are a cat owner, you know that cats are extraordinary and mysterious creatures and as such, they can develop a dental problem that is fairly unique to them and terribly painful. It is called tooth resorption. Tooth resorption is the gradual destruction of a tooth or teeth caused by special cells called odontoclasts. This means your kitty’s tooth begins to disappear below the gum line. Tooth resorption usually starts on the outside of a tooth at the gum line. Feline tooth resorption affects well over 50% of adults cats so even though this may be the first time you are learning about tooth resorption, it is relatively common in domestic cats. What causes tooth resorption? At this time there is no known cause for tooth resorption in felines, but the veterinary community is hopeful they will find the answer one day! What Are The Symptoms of Tooth Resorption? There are many symptoms of tooth resorption in cats, and these include but are not limited to; increased salivation, bleeding in the mouth, bad breath, difficulty chewing or refusal to eat hard kibble or overall difficulty eating. Sometimes the gum may be quite red around the affected tooth. In many cases, cats experiencing tooth resorption do not show any outward signs and cats will often suffer silently. This is why your pet’s annual exam is so important. Once your veterinarian has diagnosed your pet with tooth resorption, the next step is to schedule your cat for dental surgery. This is because the treatment for tooth resorption is extraction. There is no other way to repair the damage or stop the progression of the resorption. The affected teeth will become significant sources of inflammation and pain if they are not already. Once tooth resorption is diagnosed in one of your cat’s teeth, it will likely occur in additional teeth. Tooth resorption is most common in premolars in the lower jaw, but it can occur in any of your cat’s 30 teeth. Your cat will be anesthetized for their dental procedure. This is the safest way to evaluate your pet’s teeth and provide treatment (cleaning or extractions) without your pet experiencing pain and discomfort. Before your veterinarian removes any of your cat’s teeth, he or she will take x-rays of all of the teeth. These radiographs allow the doctor to fully examine each tooth and identify problems that cannot be seen with the naked eye and additional treatment or extractions can be done while your cat is anesthetized. Some teeth that are undergoing resorption may not be evident until these radiographs are taken. It is in the best interest of your pet to remove all affected teeth before they become painful and to avoid another dental procedure in the near future. Once your cat is recovered, you will have a happy, healthy feline grateful for a pain-free mouth. Your veterinarian will recommend home dental care (tooth brushing, dental diets or water additives) to help keep your pet’s mouth healthy.